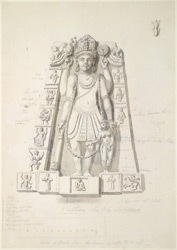 Pencil and wash drawing by Thomas and William Daniell of a sculpture of Visnu and Lakshmi at Agori (U.P. ), dated 12 and 13 January, 1790. Inscribed on front in pencil: 'Vishnou & his Wife Latchemi'; also notes. This relief depicts Vishnu and Lakshmi; the god holds in his four hands a lotus, a conch, a staff and a wheel. The figures in the compartments on the exterior represent the major avataras or incarnations of Vishnu.